Many of them do not realize it, but data has been an integral part of the lives of farmers since generations. From the general market information to climatic patterns, data plays an important role to take note of the planting cycle, watering as well as treatment plans. Farmers have adopted the latest technologies for their farming practices, which has only increased the efficiency of getting their work completed. What is not to be missed here is the fact that internet and broadband have created a significant division in the digital domain. A large number of farmers are yet to get “connected” and leverage the benefits of big data revolution which is a crucial factor driving businesses across the globe. With increasing internet connectivity and data intelligence derived from AI algorithms, devices related to the Internet of Things (IoT) can figure out and react to the environment around it. With a rapidly increasing population, it is evident that crop yields also will have to be boosted to a large extent for meeting the growing demand. This demand needs to be achieved amidst the challenges of declining water levels, shrinking lands, and damage to the environment. Today with the assistance of Internet-connected sensors and the progress in Computer Vision and AI, it has become easier than ever to figure out how a particular area of land is behaving. Land behavior is an essential element to further understand the methods to optimize the yield and also minimize the use of resources like water and fertilizers. It will be helpful to eliminate any guesses from the overall scheme of farming operations. TV broadcasting is something which is still not available to a vast number of rural regions. A considerable amount of stations still display the familiar white, black and grey static in the name of transmission. Known as the TV white spaces, these can be used for data transmission through wireless networking. It can work as a feasible alternative to Wi-Fi in such areas. The white space devices can help to find out those channels which are not used for a particular geographical location. This information helps to transmit signals resembling Wi-Fi on such channels so that there is no interference on the other channels’ transmissions. Despite a low number of channels in rural areas, a lot of data can easily be carried through without trouble. Microsoft was the first in developing a TV white space radio for enabling connectivity that is as smooth as a Wi-Fi. The technology has also proved its mettle in connecting high schools, hospitals, farms in the US and even the newly emerging economies of India and Africa. There is a solution which can benefit the small farmers for analyzing and monitoring soil activity and required microclimates as well. It will help them to avoid investing money into expensive pieces of equipment. The entire project uses an aerial approach from the ground, taking in essential data from cost-friendly sensors, satellites, and drones and then puts the algorithms of vision and machine learning to design a digital heat map. The heat map provides the farmers with an excellent solution regarding the steps they need to take on soil moisture levels, microclimates and temperature. Ground sensors have enjoyed their existence since almost a decade within the agricultural community. These sensors are powerful for sure, but they also come with huge price tags. This is where the need to use fewer sensors but soak in more information about a farm’s behavior rose. Drones and cloud technology that use capabilities of Artificial Intelligence like deep learning, as well as other machine learning techniques, offer an efficient solution to it. Edge computing is the term which facilitates data processing. It happens in close proximity to a device with the motive of eliminating lethargy and boosting the ability to switch over to action from insights quickly. In such scenarios, the camera or drone is essentially an intelligent edge device. The importance of acting quickly on the resulting images for a farmer cannot be emphasized enough in mere words. There are specific IoT systems that help in efficient data collection in agriculture. We can then use AI and Machine Learning techniques for converting this data into insights which leads to a precise farming process. The first aim is to focus on empowering farmers with cost-friendly and affordable digital agriculture techniques for eliminating confusion and guesswork from their daily lives. The next focus should be on increasing the yield for feeding the world. To make this happen, there is a need for scaling the opportunity of connectivity from channel regulators adopting TV white spaces globally. 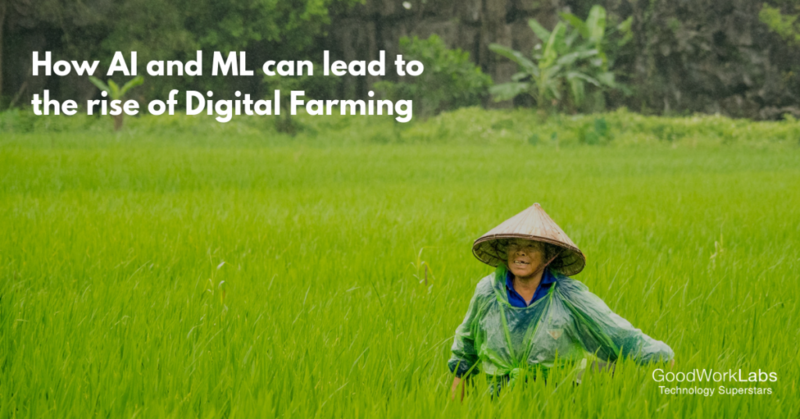 To make a significant impact on digital farming, a lot more needs to be done. With local governments subsidizing agricultural equipment, the latest and affordable technologies for precision agriculture should also be brought into relevance and supported so that they can be used widely. There is also an expanding gap between resources and education in emerging markets. A lot of farmers don’t have access to phones, education, and training for interpreting the available data. Advisories need to be created which can help these farmers to not only understand the information but also recommend the measures that need to be taken for better yields. It is safe to say that the future of farming relies on solving the data problem with connectivity and resources for collecting and interpreting the data. Collective steps need to be taken for tackling the urgency in which there is a need to connect the rural areas and work with governments and technology companies for pulling costs of data collection equipment and software. There is also the need to provide extensive and advanced education which revolves around utilizing these farming measures globally.